I sit here on my tiny little turf in blogdom and expound my thoughts on this or that. They are my two cents. Just that. And if you take issue with me on any point, I would gladly hear it, consider it, and then probably just allow for us to “see” things differently…to be ok with not “seeing” eye 2 eye on a particular point. This might be one of them. I have become more and more convinced, that when it comes to “seeing” the world (artistic, pictorial seeing), there are two fundamentally different ways that folks naturally tend to see what’s around them. This thought began as my mom and I voraciously launched into painting and drawing over ten years ago, observing her sketchbooks and artwork, observing my own, and listening to her frustrations and comments on what it felt like trying to draw and “keep” a sketchbook. Drawing felt fun & freeing to me. It was a struggle for her. Lines, sketches, pen and pencil seemed to sit naturally in my hand and give me “fair” results, whereas the same objects (for her) felt like work and wrestling to get something anywhere close to what she envisioned. But put a paintbrush in her hands, and let her put down masses and shapes…well, then she was a happy camper! When I look at my world around me, in general, I SEE lines! Really I do. They are everywhere! Glorious wonderful lines dancing around my field of vision. Only on days when shadows are crisp and long do I think first about the masses and shapes I’m seeing. When my mom looks at the world around her, she naturally SEES masses and shapes, NOT lines! A sketchbook does not come so easily for her. I noticed this and began to look for it in others. 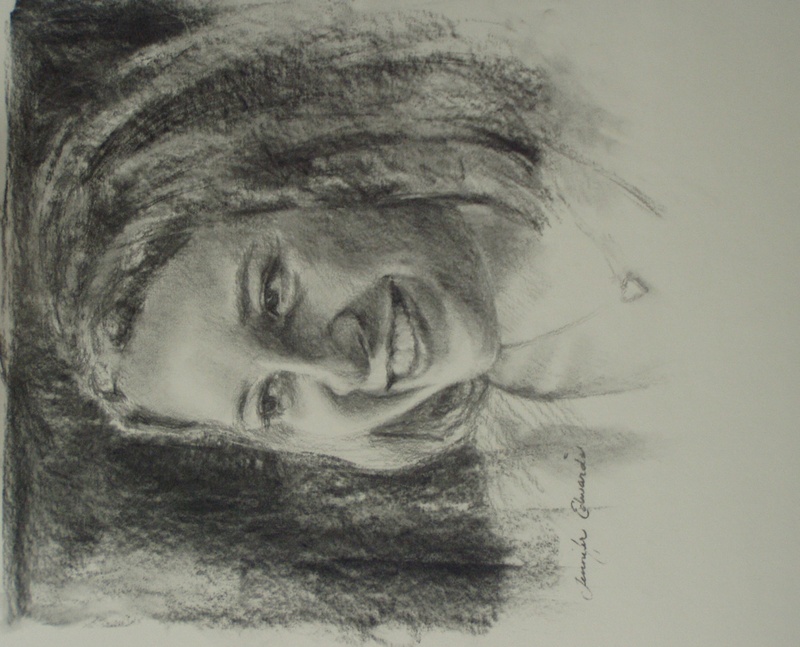 I have taught several classes for adults on drawing. I love introducing a smorgasbord of approaches for folks to try, and then see what they naturally fall into. In every class, some enjoy drawing lines, some enjoy masses. The “line” folks struggle to see the masses, the “mass” folks struggle to put down lines. Same thing has happened in teaching drawing to children. I taught 3-8th graders a series of drawing lessons this spring, majoring on seeing in line and mass. There were kids who drew with lines like they were an extension of their fingers. Other kids soared the day we concentrated on seeing the masses, the shapes. Indeed, the latter kids kept saying…I didn’t know I could draw like this! 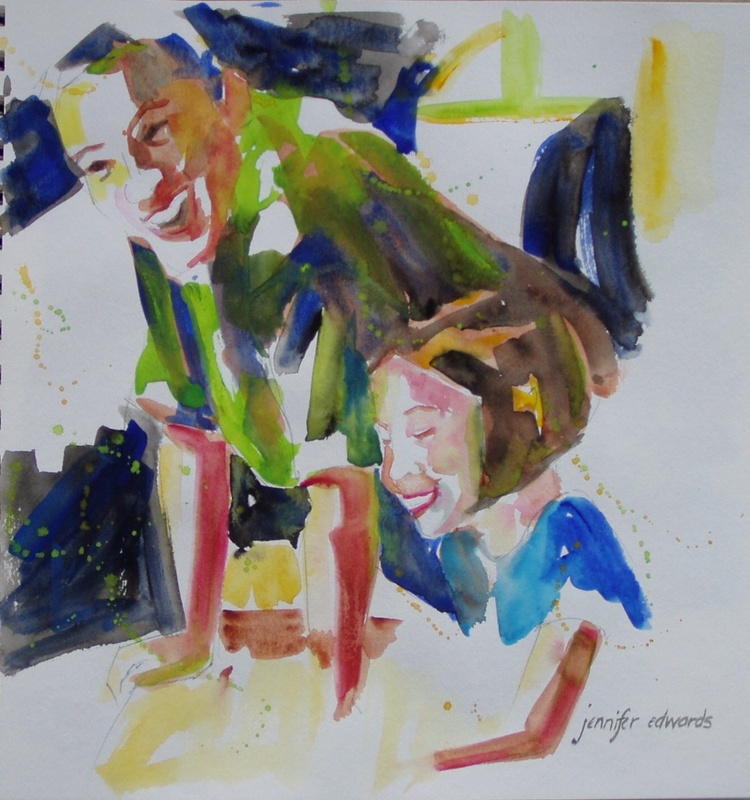 They were so pleased to be set free from the typical way of drawing with line only. They thought they “couldn’t draw” before this class. They discovered differently. In December of 2008, I took an 8-week drawing class from Scott Burdick and Sue Lyon. On the first day of class, they each described their approach to drawing. 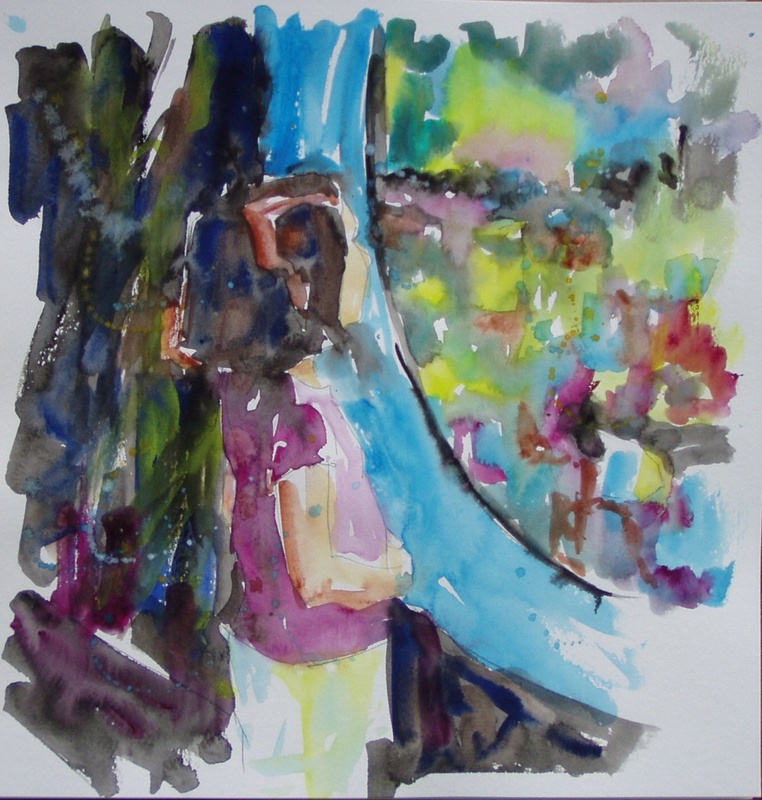 I smiled, thinking of my mom, as Sue described how frustrating keeping a sketchbook had been for her…her natural approach to rendering something on paper or canvas is to mass in the shapes. This is how she sees. Scott’s eye leans toward line, and he has filled his sketchbooks with one wonderful drawing after another, but he has also trained his eye to see in masses. This is evident in his drawings. Sue has trained her eye to see and use line where she wants/needs to. The overall thing that must be remembered here is that we each NATURALLY see the world one way or the other. And we can enjoy our particular way of seeing, growing and learning more and more about it. But we must also realize that we NEED to train our eyes to see from the other perspective! I truly believe my line drawings are enhanced by training my eye to see masses and shapes!! I will draw the contours of shadow shapes and connected shapes…not just the contours of individual objects. The reverse is true as well. My mom continues to play with line drawings in a sketchbook. It is good practice and it enhances her paintings. There isn’t just ONE way to see, ONE way to draw…BOTH line and mass are necessary to improve the other and create expressive drawings. P.S. 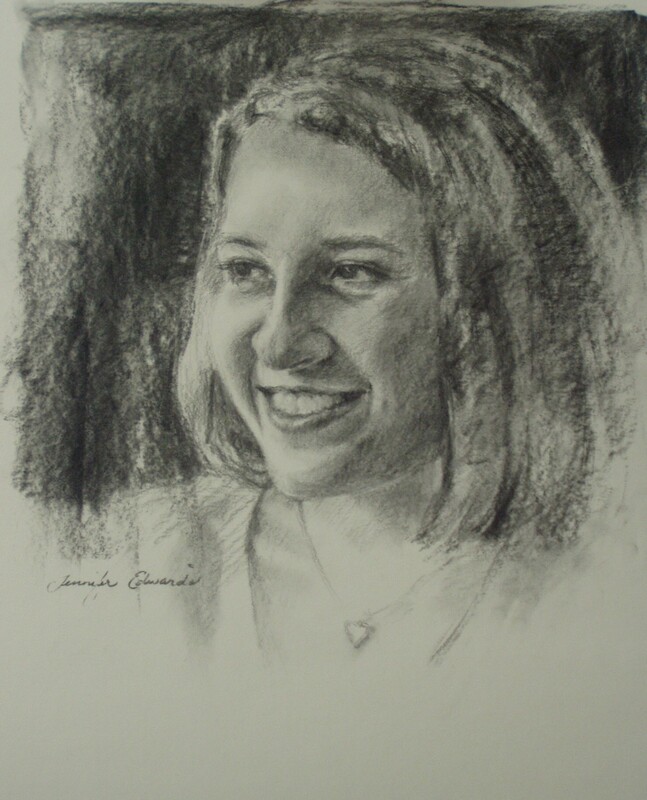 The first image is a charcoal portrait commission I completed in the fall of 2009. The second and third image is from our 2009 summer beach trip. We went to the NC aquarium…such a fun place! These are all examples of seeing and rendering masses (shapes) rather than lines. Such an interesting post – I definitely am a line person and need to work very hard and usually unsuccessfully to see shapes first. My 5 year old grand daughter is a shape person – I always call her my color block artist. I will definitely use these new thoughts and help her develop along the alternate pathway. Oh wow, this is very interesting. As a non-drawer/painter, etc., I never thought about this. But it sort of applies to life too, right? I’m definitely a mass person in that respect! I have never really thought about this subject, but now that I have, it all makes sense. I just taught a watercolor class to first & second graders and can definetly see the differences in them. By the way, love your charcoal sketch. Thanks, I have never thought about line/shape like this before. I haven’t thought much about this, either. But after your very illuminating post, i realized that i am very clearly a line person. I often have to fight the urge to outline everything, and this explains that urge. This is really thought-provoking. I really like your blog and thoughts on making art. Very insightful. Thanks for this thought provoking post. I am a line person too–my constant desire is for better line quality in my work. I have been searching for a direction to take artistically and recently realized that I need to explore pen and ink next, in search of the allusive ‘living line’. Of course, as you point out, mass is important too but right now I am hungry for more line. Your charcoal drawing and the watercolor of the two figures are both very beautiful. Hmmm…very interesting. Kind of like defining one’s self as learning better either visually or aurally. I have to see something to learn it, that comes easier. I’d have to say I’m more of line person, but even that doesn’t seem all that natural. I just WANT to be able to draw…. This is very interesting, it made me look around and look at my surroundings and consider the way I see things. I think I’m a lines person. No, not think, I’m fairly sure of it, masses and shapes seem to be difficult for me. Maybe this is why. So, how can I train my seeing to work with masses and shapes? Great post! I need to give this more thought but I believe I tend to respond to shape first and have to look harder to find the line. Great post! It made me realize that I am a shape person. Lines seem so complicated to me. I’m definitely a line person!! I have to work hard at blocking in tones and mass. I have heard the massing technique referred to as drawing like a painter. So, I guess it I really want to paint, I need to work more on this! This is another wonderful post, thought provoking. And I love that portrait! Thanks for this. It helps. I will be thinking about this- whether I am shape or line. I am a line person but trying to see shapes and values. Q–what brand H2O colors and paper do you use?